It is important to cook foods at a safe temperature to avoid food poisoning. 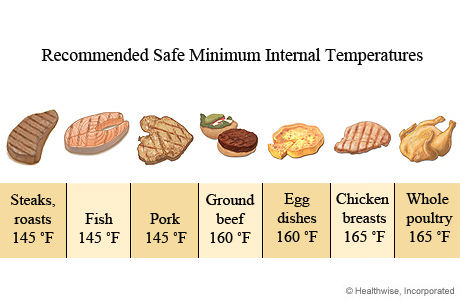 The following picture shows you safe temperatures for a number of foods. Adapted from the U.S. Department of Agriculture, Food Safety and Inspection Service (2011). Safe Minimum Cooking Temperatures. Available online: www.foodsafety.gov/keep/charts/mintemp.html. Use a clean meat thermometer to determine whether meat, poultry, or egg dishes are cooked to a safe temperature. The picture above shows specific safe temperatures. Bring sauces, gravies, and soups to a boil when reheating. Reheat other leftovers to at least 165°F (74°C). When using a microwave oven, cover the food container, and turn or stir the food to make sure it is heated evenly throughout. If the microwave does not have a turntable, rotate the dish by hand once or twice during cooking. Do not eat raw or partially cooked eggs (including cookie dough), raw (unpasteurized) milk, cheeses made with raw milk, or unpasteurized juices. Do not eat undercooked hamburger, the main source of E. coli infection. Be aware of the risk of food poisoning from raw fish (including sushi), clams, and oysters. Cook fish and shellfish until it is opaque and flakes easily with a fork. When eating out at a restaurant, make sure foods are thoroughly cooked and are served hot. U.S. Department of Agriculture Food Safety and Inspection Service (2011). Fact sheet. Safe food handling: Basics for handling food safely. Available online: http://www.fsis.usda.gov/fact_sheets/Basics_for_Handling_Food_Safely/index.asp.